With Thanksgiving quickly approaching and the need for activities to break the monotony of cabin fever, we felt the time was right to highlight a few kid-friendly educational features of the Manifold Greatness website and exhibition. On Saturday, November 26 the Folger Shakespeare Library will be hosting a “Shake Up Your Saturday” program exploring the translation of the James Bible with games, a scavenger hunt, and other free, family-friendly activities. If you are not in the Washington, DC area, the Manifold Greatness website has several features created especially for younger visitors. One of the challenges presented in the Manifold Greatness exhibition was to make to content available to as many audiences as possible—including children—in ways that are satisfying and appropriate for each. The For Kids section is inspired by the storytelling found on the rest of the site, but incorporates activities and features specially developed for today’s tech-savvy youngsters. The folks at Swim Design were great partners in making it all technically possible, and our graphic designers Andrea Leheup and Sherrill Cooper did a stunning job rendering these concepts into art. In this activity, users can create their own customized binding by virtually using techniques and tools from the 17th century. In researching this, I got to spend a couple hours in the Folger’s world-class conservation lab learning about how book covers were made and what equipment was necessary to create the gorgeous designs seen on many rare books. It was a truly “behind the scenes” kind of moment that made working on this project so enjoyable! This interactive activity is another popular feature in the Kids’ section. Our goal was to educate kids (and maybe adults, too!) about the types of materials and tools the translators of the King James Bible used, and we wanted to present the information in a fun, engaging format. Developing this feature involved research into all sorts of topics that were new to me: 17th-century clothing and interiors, writing tools, and reference books that the KJB translators consulted. Last but not least, what could be more classic than coloring and crosswords? 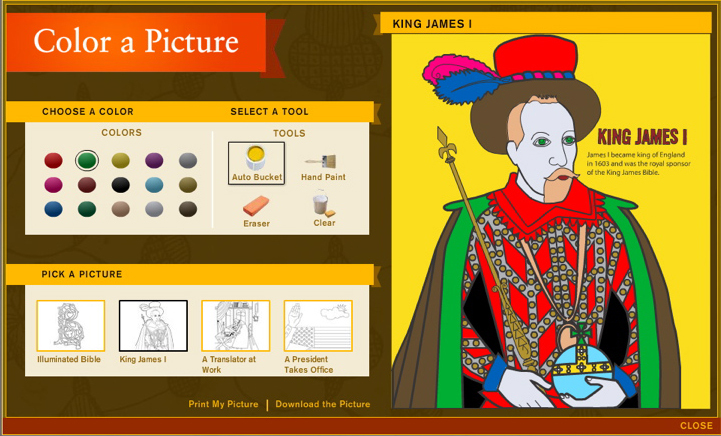 These features allow visitors to “color” online, or download pictures to color the old-fashioned way. Users can also select from crossword puzzles at a range of difficulty levels. 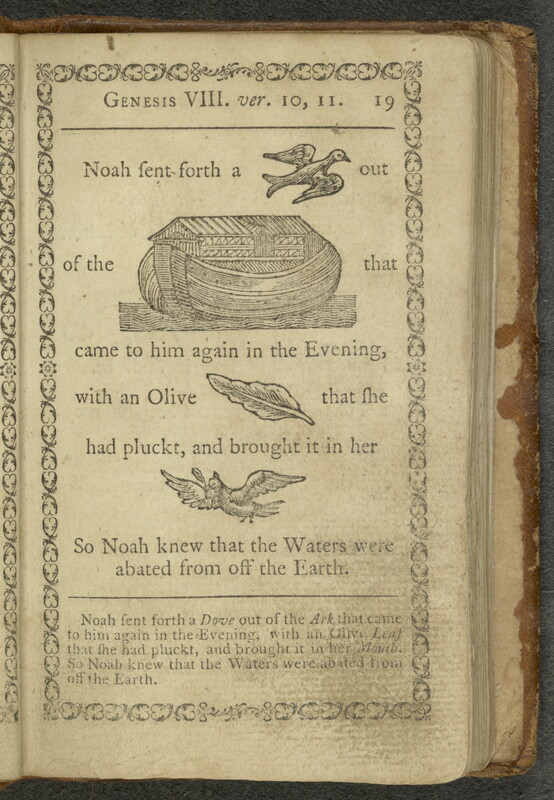 Presenting content associated with the King James Bible in a kid-friendly manner is not a new idea, as a “Hieroglyphic Bible” dating from 1788 demonstrates; in it, illustrations substituted for words in Bible passages, allowing children to “read” a mixture of words and pictures. The funny thing is, while these features were developed to educate younger audiences about the history of the KJB and how it influences life today, I found my grown-up self learning all sorts of new things about the King James Bible and the men who produced it. From the manuscript Bibles that preceded it to fun factoids about King James himself, creating this was an incredibly rewarding experience in presenting a historically significant book in a fresh and appealing way. Amy Arden is a Communications Associate at the Folger Shakespeare Library and developed the Manifold Greatness Family Guide and online content for children. This entry was posted on November 17, 2011 by manifoldgreatness. It was filed under Kids & Families and was tagged with book bindings, children and the King James Bible, education, hieroglyphic binding, translator tools, translators.